There are any number of photobook vendors out there, each with their own software for laying out pages of pics, but did you know Lightroom 4 does it too? 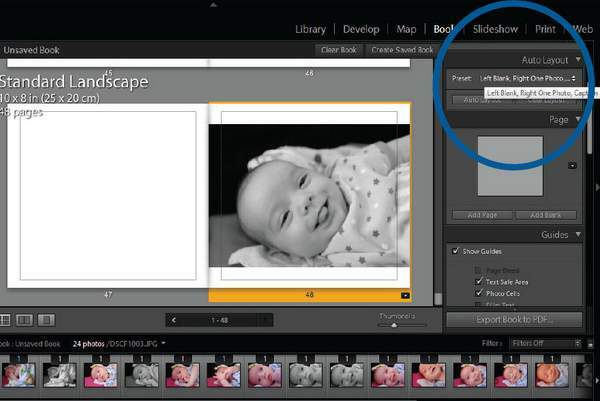 How to layout (or auto layout) your own photobooks as a first time Lightroom user or as part of your existing workflow inside Adobe’s Photoshop Lightroom. Photobooks, for which you upload images to a photo specialist to be turned into a printed and bound book, are increasingly popular today. The simple reason is that they’re great: a photobook at the end of each year of a child’s life offers a cherished set of memories which are not at risk of a hard drive crash. They also make wonderful gifts for grandparents and in later years will entertain the actual children themselves. There is also something ‘classy’ about presenting your photographic portfolio as beautifully printed images in a leather bound photobook. Wedding photographers in particular are familiar with the popularity among brides of photobooks as ways to cherish and share their memories. The beauty of Adobe’s Photoshop Lightroom is that you can easily create your photobooks in the same place you manage and process your images. 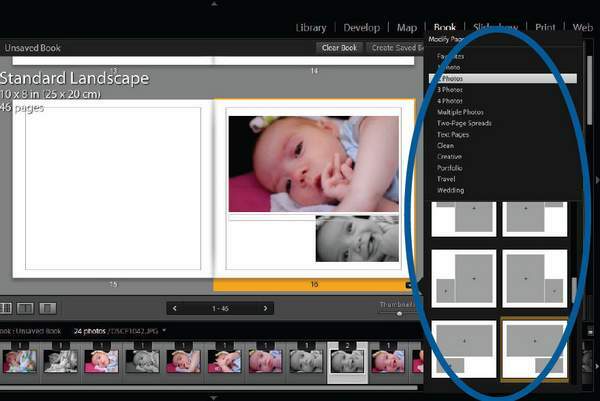 If you play with Lightroom 5 Beta – which is a free download for now – you will find that creating photobooks is now a baked in feature which is faster than web-based tools. 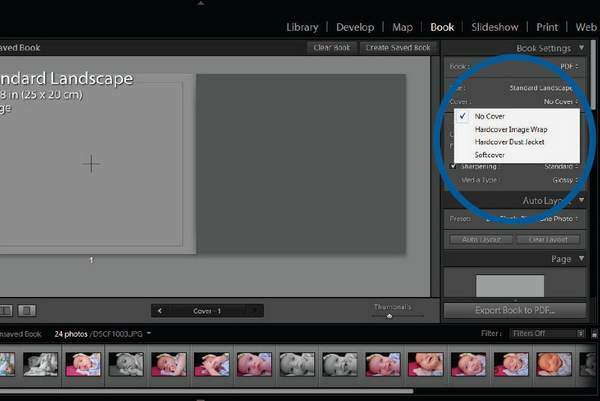 If you are not already using Lightroom for importing and editing your images, then you will want to start by importing the images you wish to use into Lightroom. 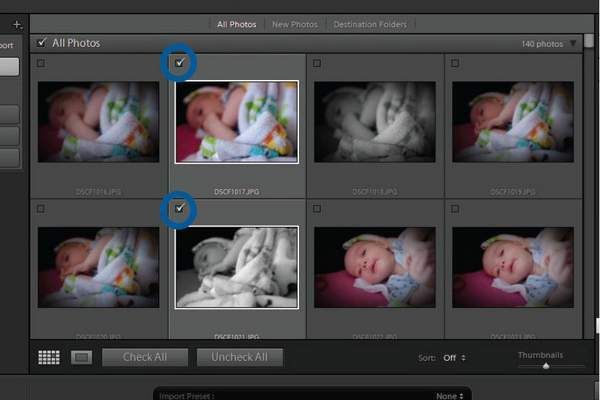 Click the import button on the left hand side and choose the ‘Source’ for where you wish to import the images. In our example, our source is the E:\ drive which happens to be our computer’s card reader. 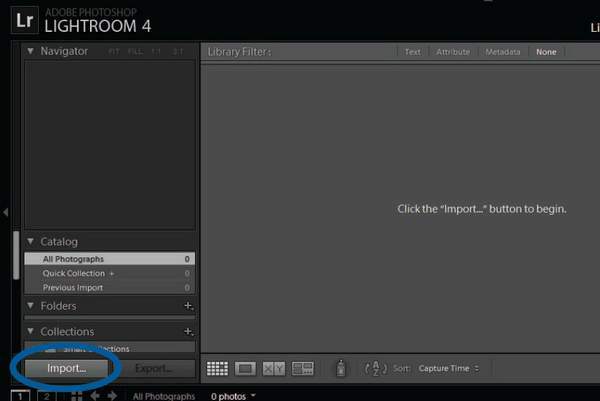 Select the images you wish to import into Lightroom. By default, leave the option at the top as ‘Copy’ and not ‘Copy as DNG’ which stands for ‘Digital Negative’ which is Adobes RAW file format. You need to choose where you want the images to be imported to. On the right hand side you can change all these options. We are exporting to ‘DATA (D:)’ drive. You can also set whether files must be renamed etc. We are setting our ‘Destination’ into a subfolder called ‘Photobook’. Once you hit import your images are now added to the library. Here you have the option to ‘Flag’ and ‘Star Rate’ your images and refine the selection of images you want to put into your photobook or even just hang on to for later use in other projects. Images can be filtered by these same criteria. 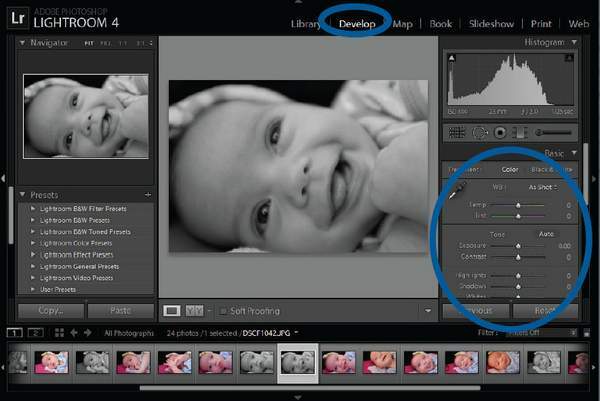 The ‘Develop’ module is where you can edit the images you have imported. You can adjust colour, noise, sharpness and apply presets to the images to get them looking just the way you want them to look before you create your photobook. 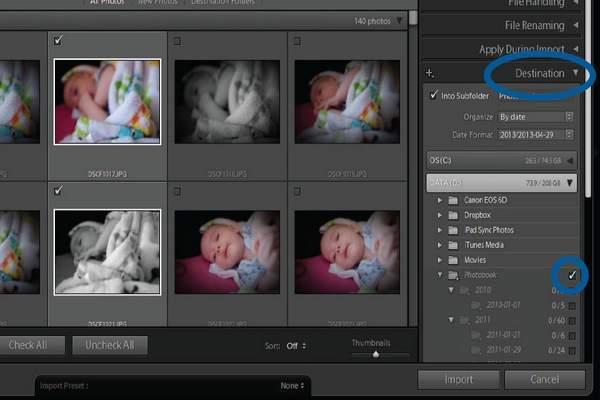 This is Lightroom’s speciality. 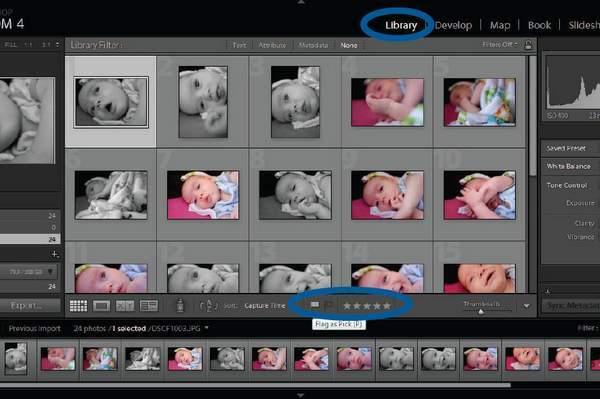 With the importing, selecting and developing of your images now out of the way, you can select the ‘Book’ option in Lightroom. The first thing you will want to do under ‘Book Setting’ on the right hand side is change the book type from ‘Blurb’ to ‘PDF’ unless you wish to order the book through ‘Blurb‘. You need to confirm – if you are outsourcing your printing – what size the printers you will print your book with can support. In our example we are opting for the ‘Standard Landscape’ option which is 25x20cm. We have also chosen ‘No Cover’ under the cover options available. 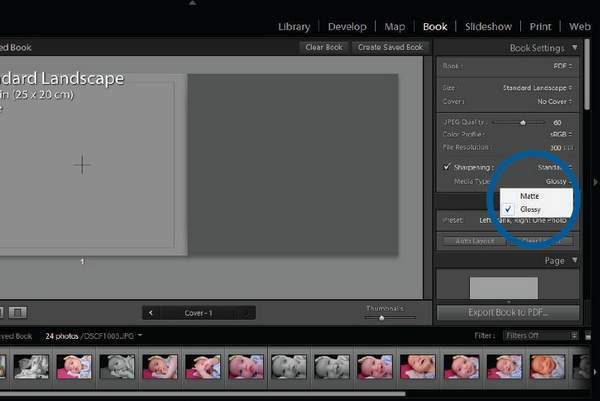 You have other settings that you can change, such as ‘JPEG Quality’, ‘Colour Profile’, ‘File Resolution’ (see last month’s ‘Software School’ if you want to understand more on this), as well as the level of ‘Sharpening’ – if any – you want applied to the book and the ‘Media Type’ – Glossy or Matt. 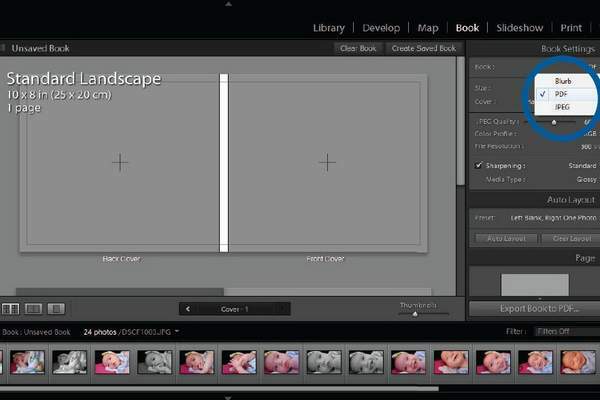 Lightroom can make the layout of the book as simple as a single click of the mouse from here on out. Under ‘Auto Layout’ you simply choose a preset you would like and click the ‘Auto Layout’ button. In our example we have gone with “Left Blank, Right One Photo with Caption”. To change the layout of a page, click the button at the right corner of the page. A pop up of different page layouts appears. 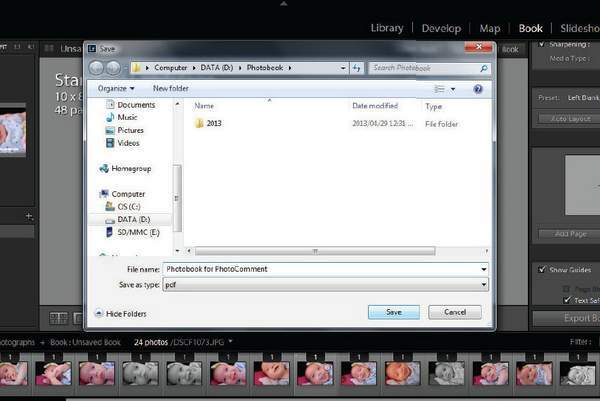 Drag images from the bottom of the screen to fill the various image blocks. Click on an image to reposition it in the page and bring up a zoom button. Even if your layout page does not have a text block you can add a caption to the page or photos using the tools in the right hand column, where you can also change text type, font size etc. You can also change the background of the pages using the ‘Background’ tool under the ‘Type’ tools. 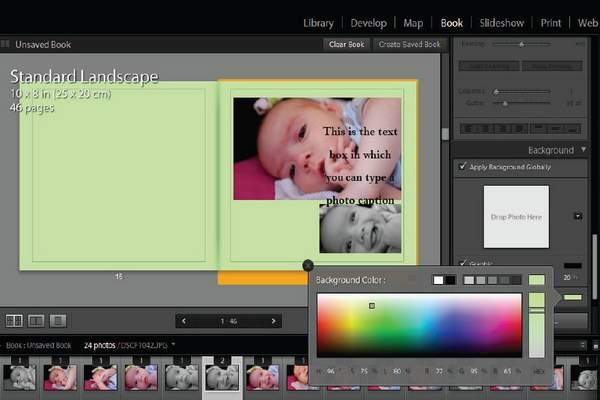 Once you have done your layout and captions you are ready to export your photobook as a PDF. Simply click the ‘Export Book to PDF’ button, choose the location on your computer hard drive – or external drive – where you want it saved and give it a file name. Now you can upload it to your printers.